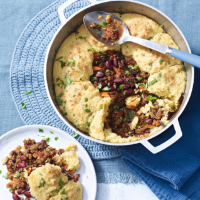 A delicious meat-free chilli dish with a cheesy cornbread topping to warm the winter evenings. 1. Spray a flameproof casserole dish with oil, add the onion, garlic and carrot, and cook over a medium heat for 5 minutes. 2. Preheat the oven to 200°C, gas mark 6. Stir the Quorn, mole sauce, chilli powder, chopped tomatoes, kidney beans and 100ml water into the pan. Bring to the boil, cover and simmer for 10 minutes. 3. Meanwhile, in a large bowl, stir together the polenta, flour, baking powder and cheese. Beat together the egg and milk, then combine with the dried ingredients to make a scone mixture. 4. Drop eight large spoonfuls of the scone mixture onto the chilli around the edges of the casserole, leaving a little space for them to expand. Bake in the oven for 15–20 minutes until the cobbles have risen and are golden. Scatter over the chopped coriander to serve. For a milder version, leave out the chilli powder. The spelt flour can be swapped for plain or wholemeal varieties.